First, I found out that pallets make a lovely backdrop for wild flowers! The year after we built our house, I started on a big project in our back yard....a pallet walkway. Because our yard is pure sand, I figured we could save on some top soil, by making wooden walkways insted of paths. 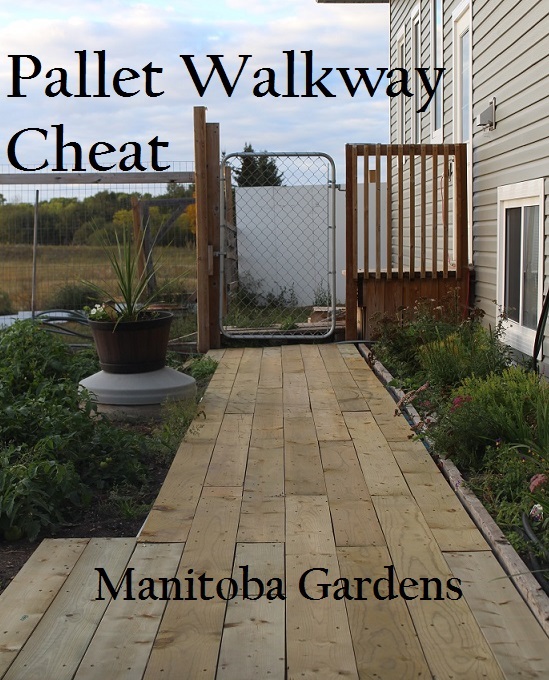 I got all of the pallets into place, and they looked great, except the gaps between the boards needed filled....which would require dismantling other pallets. That's when I found out what you probably already know....it's a lot of work to take pallets apart. I even recruited my boys to help take them apart, but they gave up after several boards coming off in splinters. 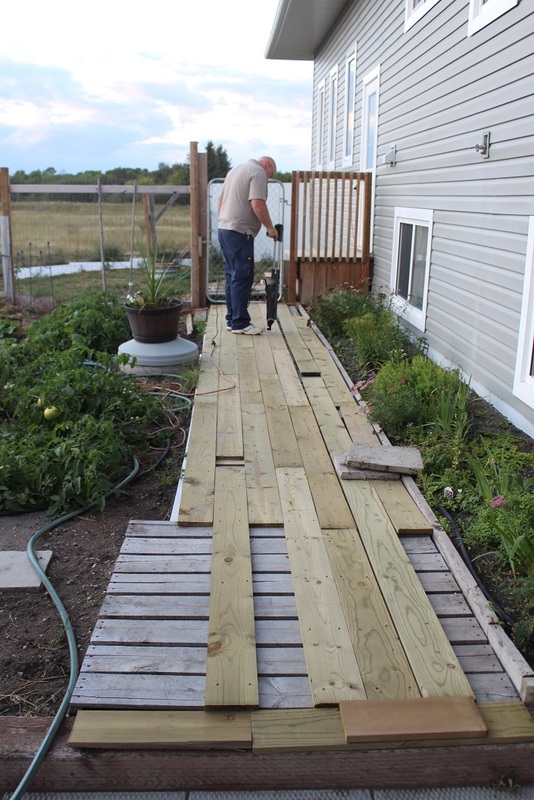 So, my walkway sat there, unfinished. 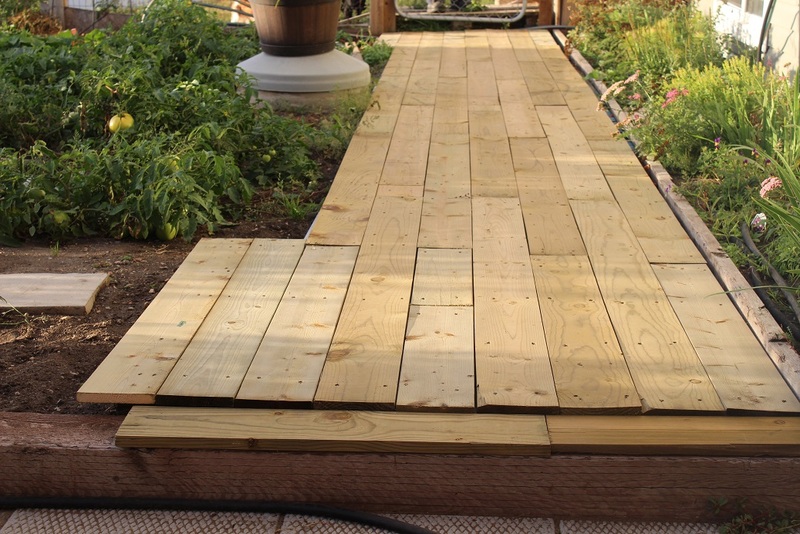 After a couple of years, the weeds had moved in, and my dreams of a beautiful boardwalk through the garden were growing dim....pieces of plywood laid on top of the pallets wasn't quite what I had in mind. 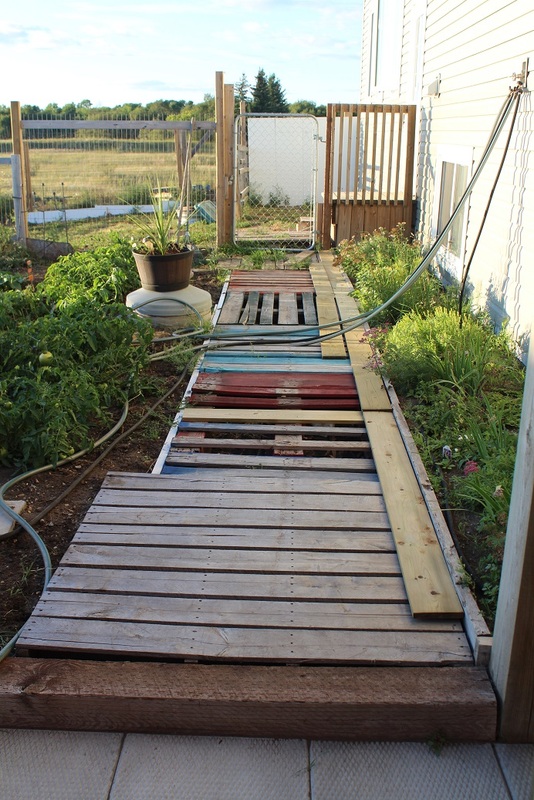 Then this spring, I decided to just pull out the pallets and redo the entire walkway...nope I wasn't ready to give up. I ended up replacing the pallets with new ones, and moved the walkway to a new area....and again it sat unfinished. 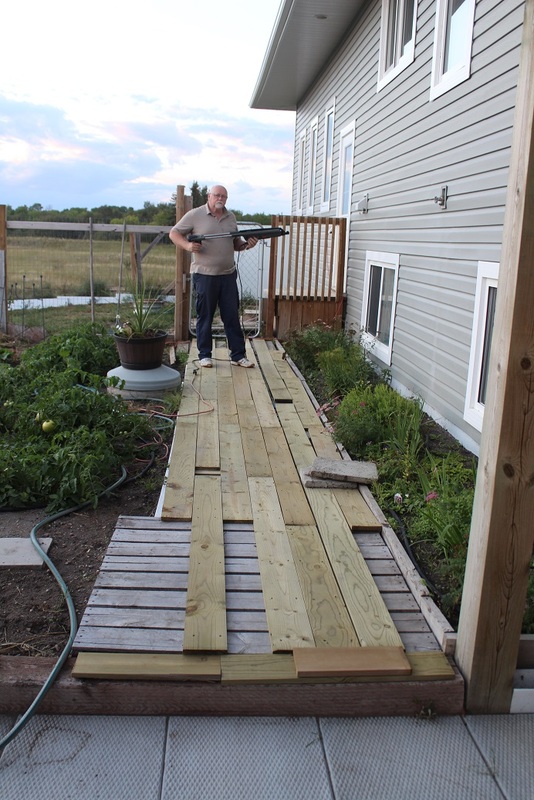 But then, Brian had a great idea...forget dismantling pallets, he'd just buy treated fence boards, and lay them length ways on top of the pallets. 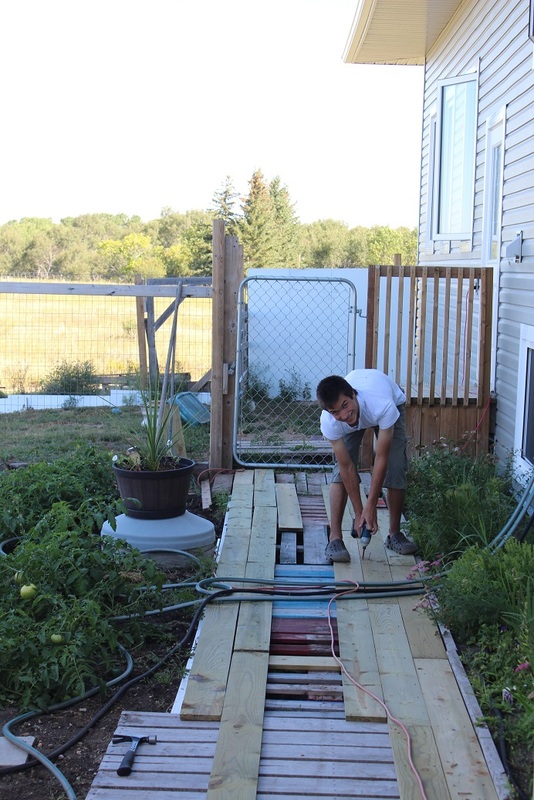 Jeremy helped out too....so much easier than taking pallets apart! 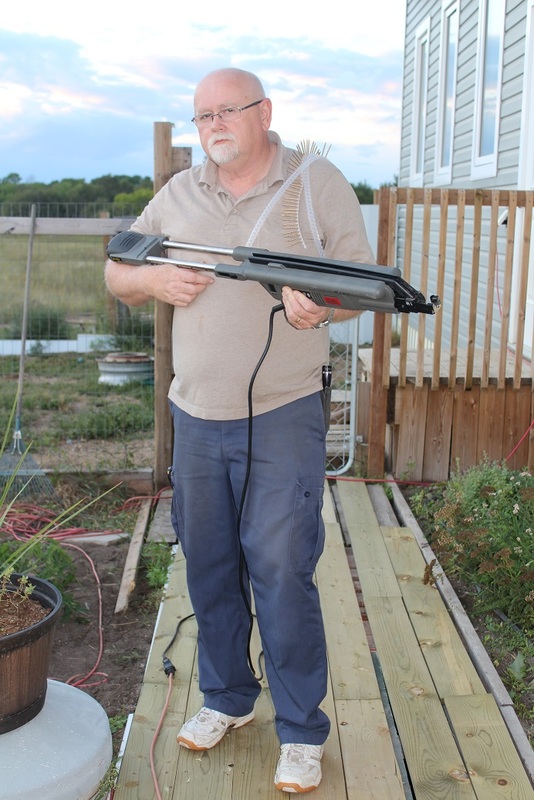 He even found a way to make the project fun! Hmmm...I wonder if this is how he'll look when I bring up the next project! 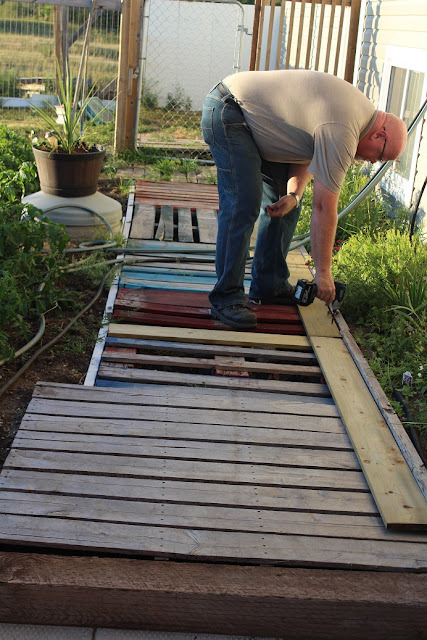 Not as inexpensive as a true pallet boardwalk; the fence boards cost about $100, but it's done, and we have a nice clean pathway from the patio to the back door. 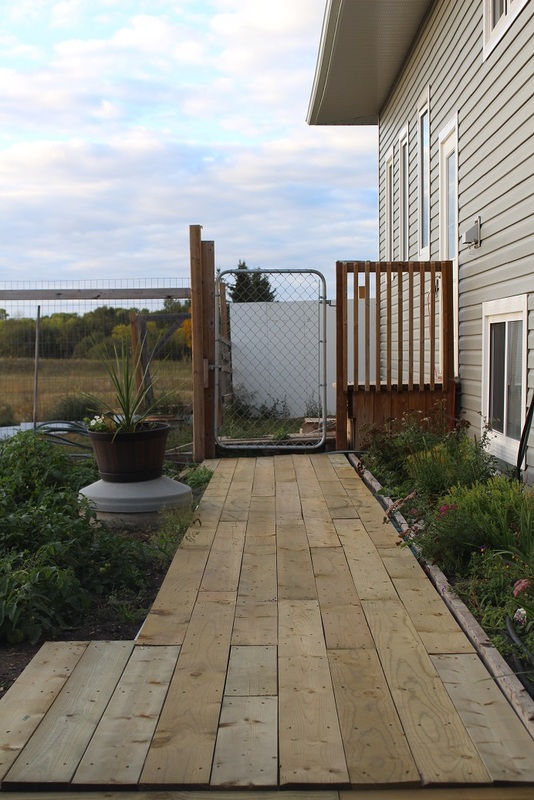 Where the pathway used to be is now more garden space. while I think of the next project for Brian to do. My husband is a pretty smart fella! Wonderful! Look what patience did! Great idea Deb! The path turned out great. Good job. That will so nice in the fall and winter when it is muddy. It's really nice to have when the ground is wet, to be able to get to the back door, but where we live, come winter, it will be buried in snow!